Indeed, new evidence was uncovered last summer by ex-FBI asset Emad Salem, proving that Abdel-Rahman, now 74 and serving a life sentence in a North Carolina federal prison, was able to issue a fatwa that helped propel Egyptian Brotherhood presidential candidate Mohammed Morsi to victory – a bit of prison-cell electioneering that prompted an immediate quid pro quo by Morsi demanding Abdel-Rahman’s release. That set off a firestorm of unwanted fears on the U.S. right that the Obama administration would be naïve enough to extradite Sheikh Omar, the head of al-Gamma Islamiyya (the Islamic Group) one of the world’s most virulent terrorist organizations; responsible for the bloody 1997 Luxor massacre in which fifty-eight tourists and four Egyptians were murdered. Still, in the bickering that turned the Sheik’s purported exit into a rallying point for Obama bashers, the full significance of Abdel-Rahman as a flashpoint for global terror has been lost. Further, the failure by administration officials and critics to appreciate his key role in the ongoing jihad could have deadly consequences in the future. Tuesday’s anniversary of the Twin Towers bombing is an opportunity for us to answer the question: just how dangerous is the blind Sheikh? Blinded shortly after birth, Abdel-Rahman had memorized the Koran by the age of eleven. He earned a degree in Koranic studies in 1972 from the Al Azhar University in Cairo, where he was influenced by the writings Sayyid Qutb, the Egyptian intellectual who was an ardent member of the Muslim Brotherhood. Founded in 1928, The Brotherhood spawned two of Egypt’s most violent terror sects: The Islamic Group run by Sheikh Omar, and the Egyptian Islamic Jihad led by Dr. Ayman al-Zawahiri. Both Abdel-Rahman and al-Zawahiri were jailed following the 1981 assassination of Anwar Sadat and by separate routes, the two of then found their way to Afghanistan; al-Zawahiri aligning with Osama bin Laden to form al Qaeda in 1988 and Sheikh Omar connecting with Gulbuddin Hekmatyar, a warlord and future Taliban commander who became one of the conduits for the billions in U.S. covert military aid to the Mujahedeen. On his return to Egypt in 1990, the blind Sheikh was subjected to house arrest, but he escaped to the Sudan and despite his presence on multiple watch-lists, succeeded in entering the U.S. in July, thanks, some say, to help from the CIA for his aid in the secret Afghan arms campaign. Before long, Abdel Rahman was preaching at the al Farooq mosque in Brooklyn and the ironically named al-Salaam (mosque of peace) located on the third floor of a building on Kennedy Boulevard in Jersey City. He was soon linked directly to two violent homicides. On November 5, 1991, one of Abdel-Rahman’s devoted followers, an Egyptian emigré named El Sayyid Nosair, committed what was arguably the first act of violence by al Qaeda on U.S. soil – the bloody assassination ofRabbi Meir Kahane, founder of The Jewish Defense League. Then within months, the Sheikh began to quarrel with Mustafa Shalabi, the Egyptian émigré who ran the Alkifah Center at the al Farooq mosque on Atlantic Avenue. The Alkifah was the principal U.S. office of the Makhtab al-Khidamat (MAK), a worldwide network where millions of dollars in cash was collected to support the Afghan war against the Soviets. After the MAK’s founder was killed by a car bomb, bin Laden and al-Zawahiri merged their new terror network with the MAK and soon al-Qaeda had what amounted to a New York clubhouse at Shalabi’s Alkifah Center. But even after the Soviets had withdrawn from Kabul, hundreds of thousands of dollar in cash continued to flow into the MAK and it didn’t take long for Sheikh Omar to covet the fortune controlled by Mustafa Shalabi. Even though Shalabi had sponsored Sheikh Omar’s entry into the United States, he balked when the blind cleric demanded half of the center’s one million dollars in annual income. After that, the Sheikh began denouncing him as a “bad Muslim” even suggesting that his fellow Egyptian was embezzling the Alkifah’s funds. On February 26, 1991, sensing that his life was in danger, Shalabi hurriedly packed for a flight to Cairo, where his family was waiting. He never made it to the airport. A few days later, a neighbor of Shalabi’s noticed that the door to his Sea Gate, Brooklyn, apartment was open. The Alkifah director was sprawled on the floor in a pool of blood. With two acts of homicide linked to the blind Sheikh within a year of his arrival in New York, the FBI soon uncovered a pattern of evidence that, properly analyzed, might have forewarned of the September 11th attacks a decade later. 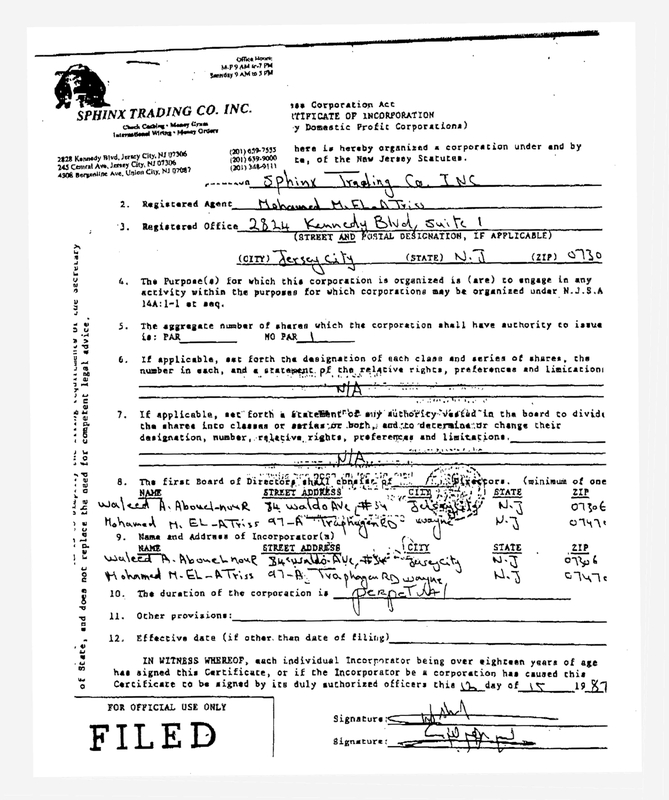 The first “dot” surfaced when the Feds identified Sphinx Trading, a check-cashing story in Jersey City where both Sheikh Omar and El Sayyid Nosair had mailboxes. Sphinx was located in a building on Kennedy Boulevard several doors away from the blind cleric’s al-Salaam mosque. The second “dot” became known in 1994 after the feds compiled a list of 172 un-indicted co-conspirators in the “Day of Terror” case in which the Sheikh and eleven others were indicted for a plot to blow up the bridges and tunnels into Manhattan, the U.N. and 26 Federal Plaza which houses the FBI’s New York Office (NYO). Named on that list along with Osama bin Laden and Mustafa Shalabi was Waleed al-Noor, co-incorporator of Sphinx Trading. Flashing forward to July of 2011 and the third “dot” — Khalid al-Midhar and Nawaf al-Hazmi, two of the hijackers who flew American Airlines Flight 77 into the Pentagon, obtained the fake I.D.’s they used to board that flight at Sphinx Trading. Who did they get them from? None other than Mohammed El-Attriss, another Egyptian who was al-Noor’s partner in the incorporation of the check-cashing store. That begs the question of how the two “bin Laden offices of origin” — the FBI’s NYO and the Office of the U.S. Attorney for the Southern District of New York (SDNY) — could have failed to connect those dots; two of which bore a direct connection to Sheikh Omar. As far back as November, 2006 with the publication of my latest book from HarperCollins, TRIPLE CROSS, I made the argument that if the Feds had only devoted a small portion of the resources they spent trying to “get” John Gotti, and monitored Sphinx Trading, they would have been in the middle of the 9/11 plot two months before al-Midhar and al-Hazmi slammed into The Pentagon. It’s a question that takes on new significance when one considers the other iconic acts of terror committed in his name since the 1993 bridge and tunnel plot. Beginning in 1996, the FBI received the first of three warnings that bin Laden would attempt to hijack a plane to free the Sheikh. When al-Qaeda took credit for the bombings of the U.S. Embassies in Kenya and Tanzania in 1998, Sheikh Omar’s release was one of their demands. Weeks before the attack on the U.S.S. Cole in October 2000, al-Zawahiri and bin Laden appeared in a video fatwa, demanding that the Sheikh be set free. Another plot to release him was cited in that infamous Presidential Daily Briefing (PDB) sent to George Bush in August 2011, and just days before the 9/11 attacks, the Taliban government in Kabul was rumored to be offering a swap — the group of eight Western aid workers being held captive, for the Blind Sheikh. As late as April 22, 2005, in entering a plea, Zacarias Moussaoui, the so-called “twentieth hijacker,” declared that his goal in the aborted plan to fly a plane into the White House, was to free Omar Abdel Rahman. Meanwhile, the blind cleric, in federal prison since 1993, has demonstrated extraordinary staying power. In December 2006, while in custody at the U.S. Medical Center in Springfield, Missouri, Rahman then sixty-eight, was diagnosed with a tumor on his liver and rushed to an area hospital after spitting up blood. It was believed at the time that he was near death and the FBI issued a bulletin warning that the Sheikh’s last will and testament, distributed by al-Qaeda, had exhorted his followers to “extract the most violent revenge” after he died. Then, exhibiting a kind of Rasputin-like resilience, Rahman not only pulled through, but began to thrive. He was eventually moved to the Federal Medical Center at Butner, North Carolina, where his continuing influence on world events became clear in the summer of 2012. In 2009 following a lecture I gave at NYU, Emad Salem, the ex-Egyptian Army officer who infiltrated the blind Sheikh’s cell for the FBI in 1992 reached out to me after years in witness protection. Salem and his family had been in hiding for 14 years after he’d served as the principal witness against the Sheikh in the “Day of Terror” trial. During a series of interviews Salem told me about a key piece of evidence in the Mustafa Shalabi homicide that had never surfaced in the media. That prompted the NYPD to reopen the investigation. As a result, the Feds produced a series of FBI 302 memos identifying the killers, along with a second gunman in the Kahane assassination. Since then, while continuing to live under an assumed identity, Salem has regularly monitored the political events in Egypt. For months prior to the election, followers of the Blind Sheikh had been camped outside the U.S. Embassy in Cairo, demanding his release. Now they were rallying in Tahrir Square. The day after Morsi’s narrow victory, Emad Salem discovered that Sheikh Omar, who is supposed to get a single, fifteen-minute “humanitarian” call to his family each month, was able to make a second call; this time congratulating the president-elect. Then, within days of his election, at a rally in front of Abdel Rahman’s family, Morsi returned the favor by declaring that he would press for the freedom of Sheikh Omar and other terrorists convicted in the United States. Rahman’s deadly influence as a rallying point for jihadists was reinforced on October 28th, 2012, when bin Laden’s successor, Dr. al-Zawahiri, issued a two-hour video calling on Muslims worldwide to kidnap westerners and “spare [no] efforts” to free Sheikh Omar. In January, the principal demand of the al Qaeda-linked Masked Brigade which staged the deadly Amenas Algerian kidnapping, was that the U.S. release Abdel Rahman and a second captive terrorist. Few, outside the conservative wing of the GOP believe there is a chance that Abdel-Rahman, one of the most dangerous terrorists every convicted, will ever leave a U.S. prison, but there are valid concerns about the continuing influence he wields as an inmate. The significance of allowing him to communicate with his followers was underscored in 2005 with the conviction of Lynne F. Stewart his former lawyer. Found guilty of conspiracy after messages from Abdel Rahman were smuggled to the Islamic Group following her visits to him in federal custody, Stewart was sentenced to twenty-eight months in Federal prison. Then in 2010, as a result of perjury at her trial and her lack of remorse, she was re-sentenced to ten years. The Second Circuit Court of appeals affirmed the sentence last June. Ramzi Yousef, who built the 1993 WTC device has been held under what the Bureau of Prisons calls “special administrative measures” since 1998. At his sentencing Federal Judge Kevin Duffy called Yousef “a virus that must be locked away,” and ever since then he’s been in solitary lockdown in a 7 by 11 foot cell at the ADX Florence, the so-called “Supermax” prison. Pursuant to a 15-page list of rules, Yousef can read books and watch a small black & white T.V. but he’s forbidden from making communications to the outside world. And for good reason. In April 2010, after years of denial by Justice Department officials and the 9/11 Commission that there was a connection between Yousef’s WTC bombing two decades ago and the September 11th attacks, the SDNY updated the superseding indictment of Yousef to include his uncle Khalid Sheikh Mohammed (KSM) for his role in the airliner hijacking plot that killed more than 3,000. But it’s clear from the SDNY’s new eight-page superseding indictment, available on the NYT website that the two attacks on the Twin Towers were controlled and funded directly by al Qaeda. Since the blind Sheikh is the convicted leader of the New York cell that spawned that first attack, his ability to communicate with the outside world should be no less restrictive than Yousef’s. The renewed cries to loosen the reins on Abdel-Rahman may have inspired his former bomb maker. On February 18, Ramzi Yousef filed suit to get out of solitary confinement and lift the measures muzzling him from speaking to the outside world. Claiming that he’s no longer a threat, Yousef, who also designed the “planes as missiles” plot carried out by his uncle KSM on 9/11, has asked the Supermax warden for permission to enter the general prison population. President Obama, is scheduled to meet with Dr. Morsi in March. At that time, the Sheikh’s freedom will be at the top of the Egypt’s agenda. But the U.S. president would do well to remember the bomb planted by Ramzi Yousef twenty years ago Tuesday. Executed by a cell controlled by the blind Sheikh, it was a precursor to much of the al Qaeda terror that followed and as Santayana warned, history forgotten is history relived. Peter Lance is a five-time Emmy-winning investigative reporter now working as a screenwriter and novelist.